Mar 1, 2004 — Construction of a security barrier is Israel’s best short-term option against Palestinian terror attacks and demographic dangers that threaten the country’s Jewish character. That analysis came during a panel discussion sponsored by Yeshiva University’s Stern College for Women at the Center for Jewish History, home to the Yeshiva University Museum. The Feb. 29 discussion, “Israel and Her Neighbors: Peace in Our Lifetime?”, kicked off a yearlong series of lectures celebrating Stern College’s 50th anniversary. The discussion covered a range of issues affecting Israeli-Arab relations and peace prospects in the wake of Saddam Hussein’s defeat and capture and Washington’s war on terror. The event was presented by Stern College’s Dr. Marcia Robbins-Wilf Scholar-In-Residence Program, which brings leading thinkers, authors, and artists to the school each year. David Makovsky, a senior fellow at the Washington Institute for Near East Policy, said the security barrier—a snaking web of walls, razor wire, patrol roads, watchtowers, and electric fences—is crucial to stopping Palestinian suicide bombers, such as the one who killed eight Israelis on a Jerusalem bus Feb. 22. Mr. Makovsky shared the stage with Malcolm Hoenlein, executive vice president of the Conference of Presidents of Major American Jewish Organizations. 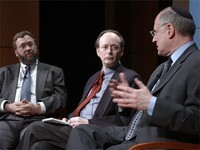 Gary Rosenblatt, editor and publisher of The Jewish Week, moderated the hour-long discussion. Both Mr. Makovsky and Mr. Hoenlein had harsh words for the decision of the UN’s International Court of Justice in The Hague to hear oral arguments on the barrier. Mr. Hoenlein said the justices were pandering to Arab pressure and should have recused themselves from the case. The two men also endorsed Israel Prime Minister Ariel Sharon’s plan to withdraw from parts of Gaza and the West Bank, and said such moves could presage future opportunities for peace, but only if Arab governments cease their support of Islamic terror groups. Karen Bacon, PhD, Dr. Monique C. Katz Dean of Stern, introduced the program. Dr. Robbins-Wilf closed the session.